Taking inspiration from the 1970’s Seiko divers, TC-9 has done their own versions but in bronze. I really like bronze because of the natural patina that forms on it, and gives it such character. Last year I reviewed TC-9’s 1970’s Bronze Diver, and now, a little more than a year later, TC-9 has their second generation version available on Kickstarter. They were able to send me out one of their pre-production models so I can see what sets this second generation apart from their first 1970’s Bronze Diver. Both are very nice, but there is so much more that sets this apart from their first generation model. 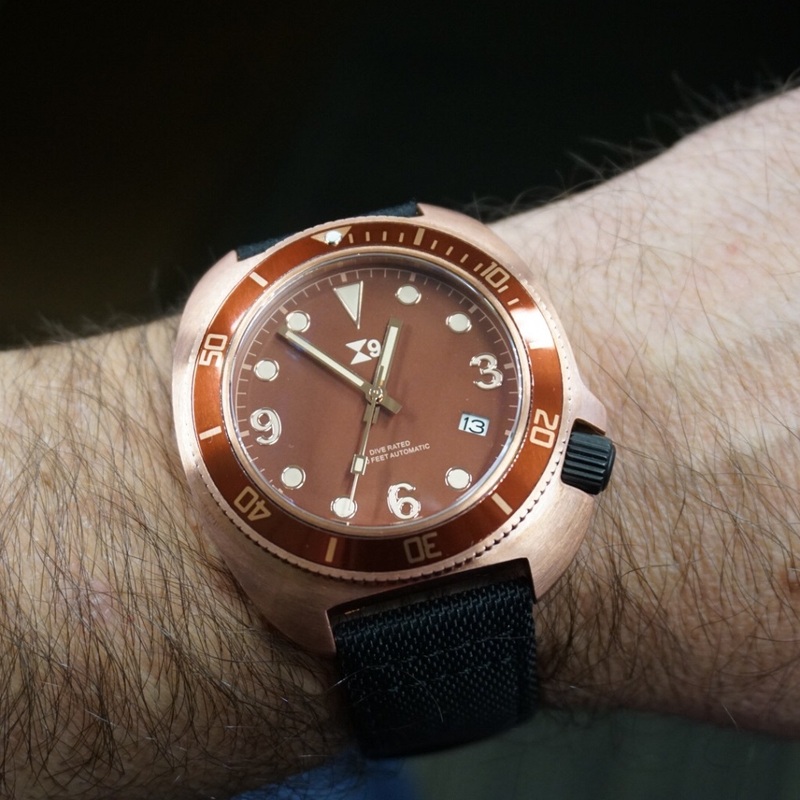 Lets take a look and see what’s new with this TC-9 1970’s Bronze Diver. This second generation of the TC-9 1970’s Bronze Diver has seemed to go towards a bit more of a dressed up and refined look. There are several dial options. There is the red dial (featured in this review), a black 12 hour dial, and black 24 hour military time dial. The hands have gone slimmer to enhance accuracy and add to that more refined look. Powering this is a reliable Seiko NH35A automatic movement. There are three models available: The Military, featuring a military style 24 hour dial and a 12 hour counter bezel, the Classic, featuring a black dial with vintage yellow/cream luminous paint and minute counter bezel, and the red one, featuring a burgundy red dial and bezel with matching vintage cream colour lume. They all look very nice, but this Red model has a much more dressy look. I could totally wear this to the office. I love the turtle cases on these vintage inspired TC9’s divers. Their first model of this 1970’s diver was very nice, but a little rough around the edges. It had a more tough, tool watch look. Banging it up or getting scratched would just add character to it. I feel this second generation diver is a bit different. The finish on the bronze is much smoother. The case is made from solid bronze and measures in at 44mm wide, 48mm long, and 13mm thick. Water resistance is 300 meters/1000 feet, which is what you need in a real dive watch. They use a large domed sapphire crystal which really looks fantastic. On the first generation, there was a stainless steel crown and now they use a larger PVD coated screw-down crown, matching the black canvas strap. The larger crown on this model fills in the gaps between the crown guards, which makes for a much nicer look. Another big change on this new model is that TC-9 has chosen to go with a solid screw down case back over the exhibition case on the first model. Normally that would bug me, since I live to see the movement, but in this case, I am ok with it. The case back is a black PVD case back which really looks good with the bronze case. Lots of lume is used on this 1970’s bronze diver and really looks great. All of the hour markers, numerals, and hands are filled with superluminova paint and put out a brilliant glow. The TC-9 1970’s Bronze Diver comes with a ballistic nylon strap with leather backing. The strap and black PVD buckle are signed with the TC-9 brand. This strap is very solid, but softens up fast and is very comfortable on the wrist. This strap is one of the better made straps I have worn. I really like TC-9’s first 1970’s Bronze Diver and with this new model I have to stay they kicked it up a notch, for sure. This diver is more refined in many ways, and has gone from a rough around the edges tool to an office-worthy tool that can still take any dive condition. Early bird prices start at $262 USD, an incredibly good price for what you get. They even come with a leather travel case. Go check them out at Kickstarter. Who’s it for? Vintage diver fans. Would I wear it? For sure. What I’d change: Exhibition case back would be nice. The best thing about it: Vintage style.